For my Cub Scouts "Cook" Badge, I have to prepare and cook dinner for my family. 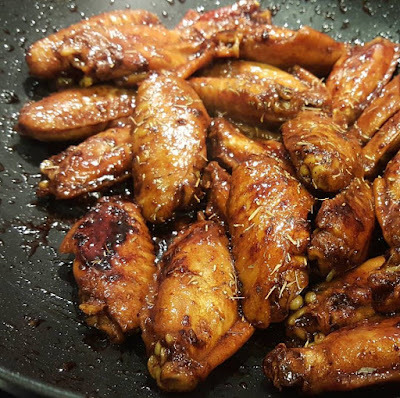 One of the dishes I made was my Chicken Z-Wings. It was quite easy to make. Everyone loved it, especially me. I had 6!!! Here is the recipe in case you want to try to make it yourself. ù Add a bit of oil to pan. ù Cook the garlic for about one minute. ù Put in the chicken wings. ù Stir around for a bit. ù Add in the rice wine and the light and dark soy sauce. Stir for a bit. ù Cover and cook for 10 minutes. ù Put sugar in. Add a bit of water if too dry. ù Cover and cook on low heat for another 10 minutes. ù Add in Italian seasoning.